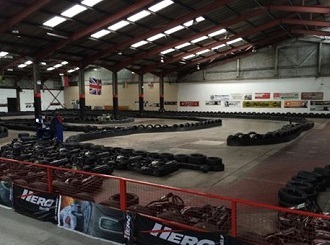 If you’re looking for some karting within easy reach of Birmingham or Cheltenham then Worcester Karting may be just what you are looking for. It is only two minutes from J7 off the M5 Motorway and close to the heart of the city centre. The venue caters for anyone from the age of 8 years upwards and also has lasertag gaming available. But (drumroll please...) the big attraction for us is DRIFT karting. This is currently the only circuit in the UK offering this and the karts have been specifically designed and built to go sideways - how much fun is THAT? From Junction 7 on the M5 take the B4084 Whittington Road eastbound. Turn right at Woodbury Lane, Crucible Business Park will be on your left. A non-exclusive 20-minute session in modified karts that have been specifically designed to spend most of the lap sideways and drifting. Huge fun and guaranteed to bring a smile to your face. An adult-only race event: 15 Lap Practice, 2 x 25 lap heats then top 8 Drivers entered into 20 lap final. An adult-only sprint race: 10 minutes Qualifying session, followed by a non-stop 60 Lap Race. A non-exclusive 2 x 20-minute session in modified karts that have been specifically designed to spend most of the lap sideways and drifting. Huge fun and guaranteed to bring a smile to your face.